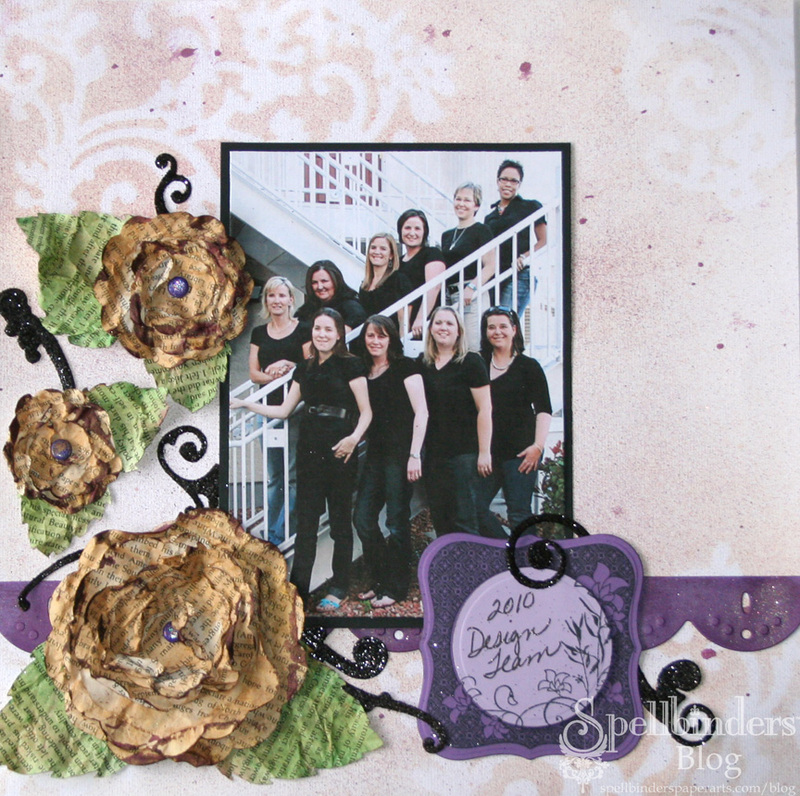 ← Big News- SCRAPBOOK ADHESIVES By 3L DT! How are you celebrating NSD? 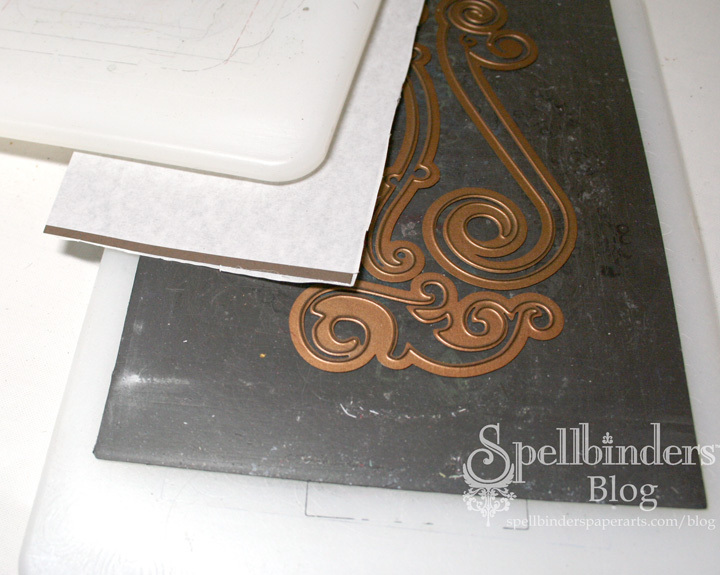 Have you entered the contest at Spellbinders™ yet? My intent was to show how to make the flowers (love them! ), but I ended up with 3 techniques, so enjoy! Let me start with the flowers, these are all the rage right now, and they’re so easy to make! 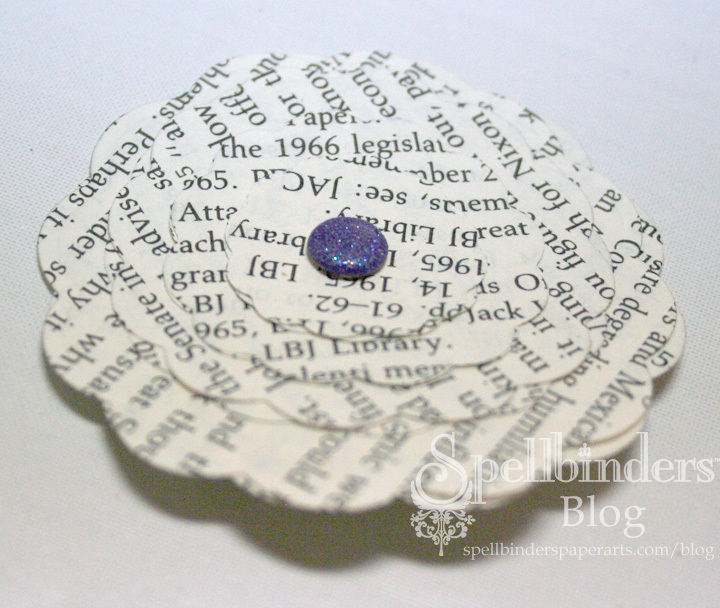 I cut/embossed some old book pages with S4-249 Big Scalloped Circles LG. I used all the dies in this Nestabilities® set. It was thin paper so I did 3 pages at once. 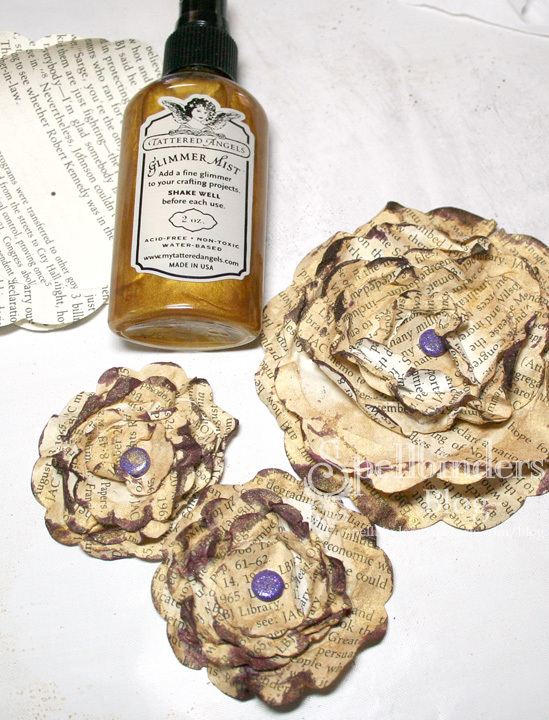 Attach single layers with a brad to make 3 flowers. Spritz with Glimmer Mist, scrunch with your fingers, and dry with your heat tool. Repeat until you have the depth of color desired. You can use more than one color. For the finishing touch, I spritzed a darker color onto my silicone mat and touched the scrunched edges into it, then heated until dry. The flowers will hold the scrunched shape. 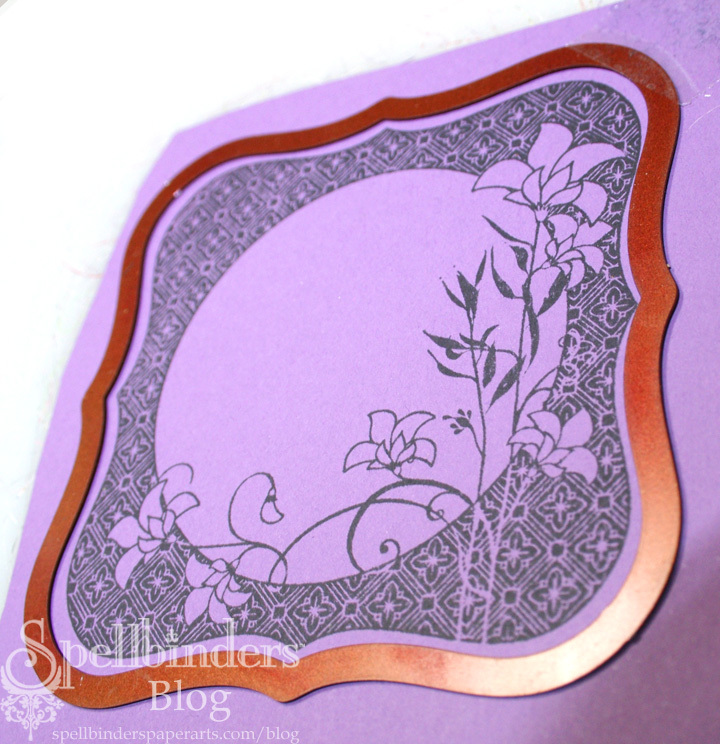 Next I stamped the Gina K stamp onto light and dark purple papers. I cut/embossed S4-114 Standard Circles LG #4 (#1 is the smallest) to perfectly cut the center from the lighter cardstock. The darker stamped cardstock was cut/embossed with S4-161 Labels One #4. The lighter piece was centered and adhered with 3D Foam Squares for dimension, over the top of the darker one. Are you still with me? I used a piece of brown scrap paper and applied adhesive on both sides, using SCRAPBOOK ADHESIVES BY 3L™ 12×12″ Adhesive Sheets. I set the paper down on the sticky sheet, ran my brayer over it, then folded it over to apply adhesive to the other side. Cut this with S4-121 Doodle Parts in the Wizard™. 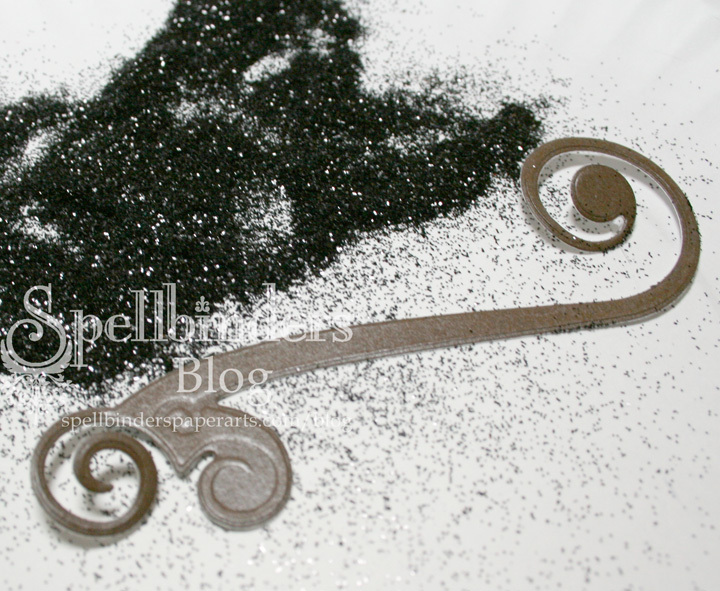 I peeled the backing from one side and applied black glitter to each piece. I peeled the backing from the other side to adhere it to the layout. This idea made it easy to add the glitter and I didn’t have to mess with adhesive once I had a glittery piece, because I already had glitter everywhere! I’ll be sneezing glitter for days! And Cindy sure looks sparkly. Next I assembled the layout onto white cardstock that had been masked and Glimmer Misted with colors to coordinate with the flowers. The E-Z Runner adhered everything else to the layout. 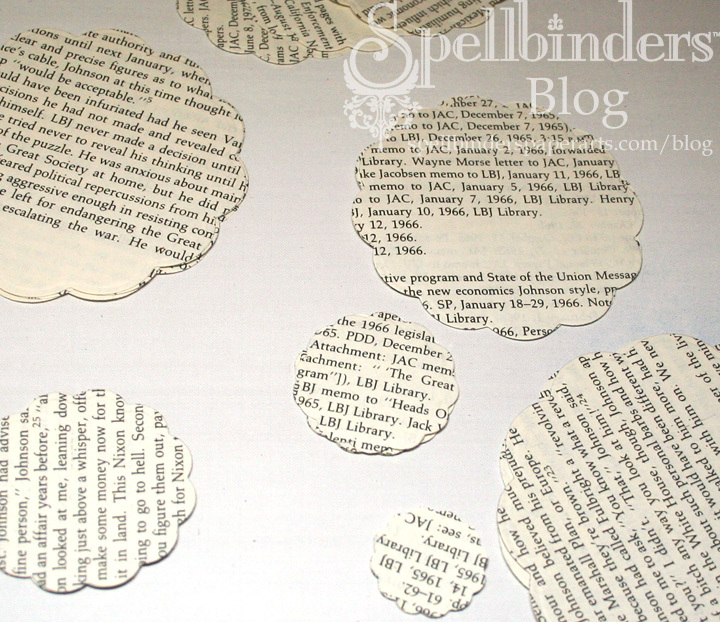 These are the supplies I used: Spellbinders Wizard™; S4-249 Big Scalloped Circles LG; S7-018 Big Scalloped Border Grand; S4-161 Labels One; S4-121 Doodle Parts; S4-157 Sunflower Set One; S4-158 Sunflower Set Two; S4-114 Standard Circles LG; Worldwin, White, Light Lovely Lilac, Dark Lovely Lilac, Black; Gina K, Lovely Labels Stamps; Creative Impressions, Bright Glimmer Round Fastener; SCRAPBOOK ADHESIVES BY 3L™, E-Z Runner, Adhesive Sheets; Clearsnap, Colorbox Black Pigment Ink; Tattered Angels, Antique Brass, Meadow Green and Haunted Shadow Glimmer Mists, Glimmer Screens; Sparkle N Sprinkle, Black Ice Glitter; Copic, atyou Spica Pitch Black pen. This entry was posted in Scrapbook, SCRAPBOOK ADHESIVES By 3L, Spellbinders and tagged Nestabilities, Spellbinders. Bookmark the permalink. 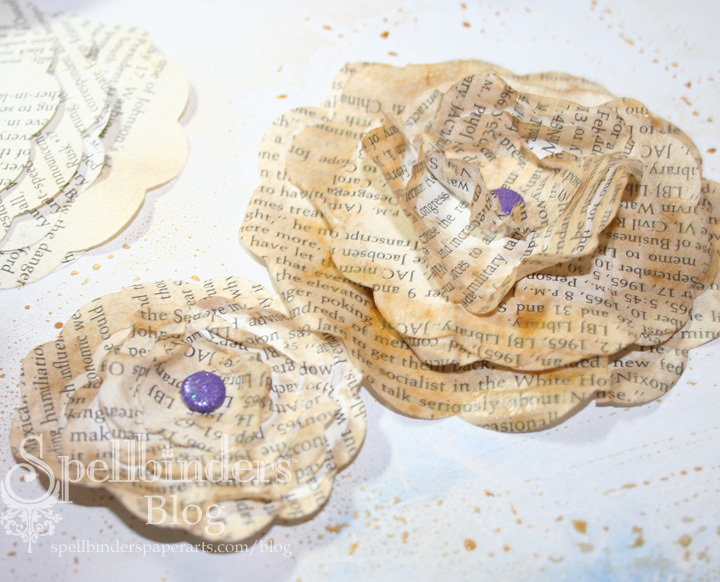 Ooh la la Beth, loved seeing this on the Spellbinder Blog – love the flowers, I MUST try this technique out asap! 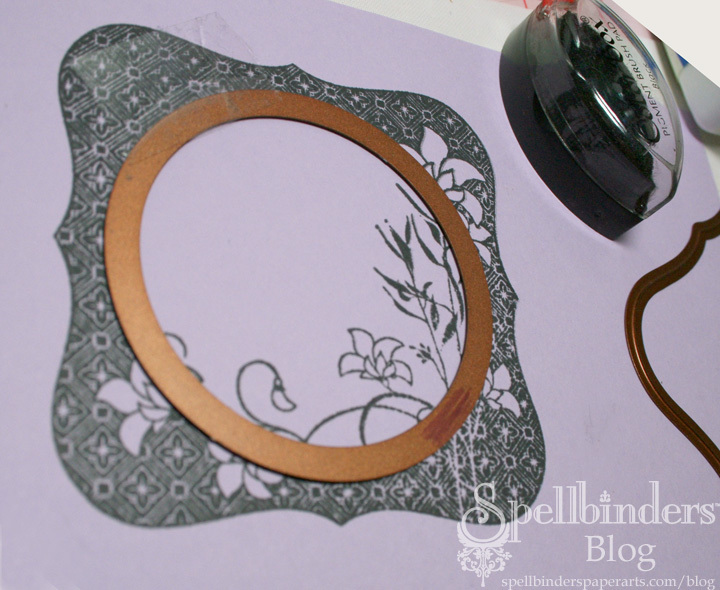 Love the combination of spellbinders you use – you make it look so easy! I must use my flourish dies more often, you make them look so elegant. Love seeing the beautiful photo of the DT! This is gorgeous, Beth! I feel like a movie star! tee hee. Enjoy your scrappin’ day!! !